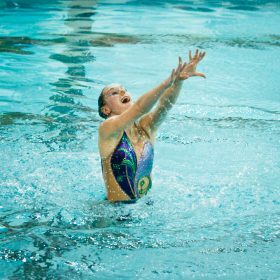 ANA Synchro is the only YMCA synchronized swimming team in the country with both an Olympic class athlete and nationally ranked judge in its full time coaching staff. Plus 11 assistant coaches and a network of experts on nutrition, injury prevention, strength training, and mental preparedness. This summer we qualified 34 athletes for the US Junior Olympic Championships. ANA Synchro attended the prestigious event in Oxford, OH in June and was represented by 5 team routines and 6 small routines. ANA came home with a 1st place finish in 16-17 Duet coached by Reem Abdalazem, 4th place in 16-17 Team, and 9th place in 16-19 Combo coached by Reem and Leah Pinette, and all our other routines placing in the top 30 of our country. This competition hosted nearly 1,000 athletes from over 75 different club teams! We brought our largest contingent of athletes to both the 2018 Junior Olympics and U.S. Junior & 13-15 Age Group National Championships held in Lewisville, TX. We had our highest placement at US JR Nationals ever for ANA Synchro with a 3rd place finish in both the Junior team and Junior combo, coached by Reem Abdalazem. We made history! The athletes were Reverie Nedde, Nina Robbe, Sophia Ju, Sofia Puchniak, Olivia Malloy, Kyra Donahue, Ella Sharon, Victoria Carlson, and Camille Robbe and Ysabella Ouyang joined in for the combo routine. At the Age Group East Zone Championships, the Junior Team took home the gold. The first gold medal at an age group zone competition in ANA Synchro history! Both the 12&Under Age Group and the 13-15 Age Group teams respectively earned bronze medals in their team events. ANA Synchro successfully qualified all our intermediate team routines to the East Zone Intermediate Championships in York, PA. ANA Synchro attended with 30 intermediate athletes and 13 12&Under Age Group athletes; placing all routines in the top 10! ANA came home with a gold medal in the 13-15 Intermediate Duet as well as silver medals in our 13-15 Intermediate Team, Trio and 11-12 Intermediate Team and Trio. Reverie Nedde represented the Junior National Team 2 at the UANA Pan American Championships held in Riverside, CA this August. Nedde competed in the Junior Free and Tech duet, placing third for Team USA.